One of the most defining characteristics of a diamond is its cut, since this is what gives a diamond its sparkle. While high grades of color, clarity, and carat weight also contribute to a diamond's price and appeal, it's the cut that determines the symmetry of the stone's facets, its overall proportions, and its ability to reflect light (aka the ‘bling-bling’ effect). Cut does not refer to shape (round, princess, oval, etc.) but the symmetry, proportioning and polish of a diamond. The cut of a diamond greatly impacts a diamond's shine or brilliance. This means if it is cut poorly, it will be less luminous. Diamond Hedge Ideal cut: Represents roughly different companies' top 1% of diamond quality based on cut. The highest grades of polish and symmetry allow it to reflect even more light than the standard ideal cut. 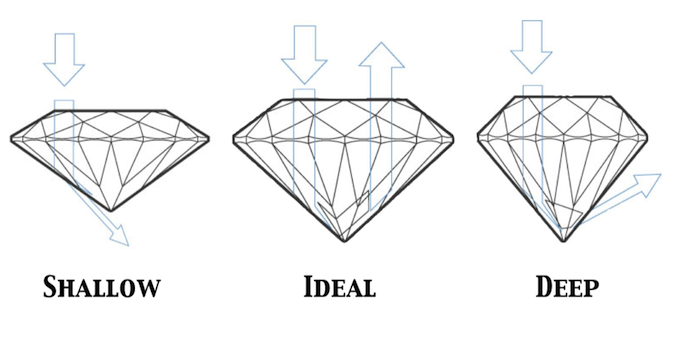 Ideal cut (Excellent cut): Represents roughly the top 3% of diamond quality based on cut. Reflects nearly all light that enters the diamond.